Dual State Electric Services. Industrial electrical and electrician services. 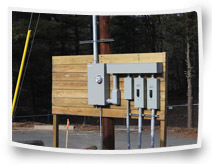 Installation of high voltage power systems. Serving Merrimack, Middlesex, Boston, Massachusetts and New Hampshire.HAZWOPER OSHA 40 CERTIFIED. Our Industrial Electrician Division focuses mainly on the installation of high voltage power systems for larger warehouses and machinery. 2000 amp services, 4" conduit racking systems 35 ft in the air, 12-14 sub panels, and hundreds of lights are common jobs for this part of our company. 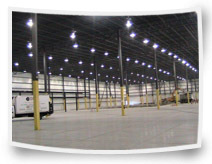 What makes us unique is that we also have the ability to install the low voltage, fire alarm and office space electrical that usually is attached to the warehouses that some companies just don't do. We build systems so they won't fail by going above the basics when it comes to design. We work closely with site engineers and managers to make sure the project runs smooth and on budget. With over 10 years experience, we get it done right. Dual State Electric has recently finished this estimated 20 million dollar project to power a 300 ft long corrugator machine. Dual State Electric was hired for the Government Superfund Site to install a 600 Amp 3 Phase service with 6 subpanels, 132 400 Watt High Metal Halide High Bay lights, Emergency lighting and 100 Outlet boxes throughout a large industrial building in Concord MA.